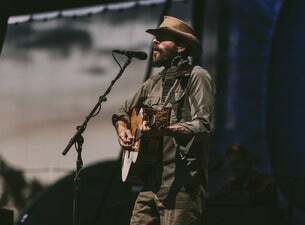 Ray Lamontagne is no stranger to the world Folk music. His fourth album, "God Willin' & The Creek Don't Rise," released in 2010, won the Grammy for Best Contemporary Folk album, and he subsequently embarked on the 2011 Pariah Dogs Summer Tour, so named after his new band The Pariah Dogs. With a soulful upper register and a breathless falsetto that adds hints of R&B to otherwise straightforward folk arrangements, LaMontagne's voice is always at the center of his performances. The typically reticent singer keeps banter to a minimum at his concerts, pouring his concentration into the songs, at times even singing with his eyes closed. LaMontagne's journey to the spotlight has been anything but conventional. Though he released his debut album "Trouble" in September 2004, it didn't receive popular attention until nearly two years later, when it made a top five entry in the UK charts and eventually went on to sell over 250,000 units in the US alone. By the time of his second release, 2006's "Til the Sun Turns Black," LaMontagne was fast becoming a household ticket, his songs appearing in television shows like "Rescue Me," "Grey's Anatomy," and "Bones." Once again teaming with producer Ethan Johns, LaMontagne's critically-acclaimed third album "Gossip in the Grain" entered the Billboard charts at No. 3, his highest entry to date, entering the Billboard charts at No. 3. Though not a radical departure from his earlier output, God Willin' & the Creek Don't Rise marked a subtle changes to LaMontagne's sound and recording process. He opted to self-produce the album at his home in Massachusetts, and it marked the first collaborative release with his band the Pariah Dogs. While a few songs venture into slightly more aggressive territory (bookends “Repo Man” and “Devil's in the Jukebox”), the album is otherwise characterized by hazy Americana instrumentation and LaMontagne's yearning vocals.